During the day, from 11 a.m. until 7 p.m., local farmers, craftsmen and associations will present their productions and activities in the Frassinello’s Castle, which in the Middle Age was a court of the Aleramic marquises, where assemblies and trials were held, and in the Renaissance a residence of the Gonzaga-Nemours counts, who embellished its rooms with beautiful frescoes: the public will be able to access it free of charge, and in its interiors participating in guided tours (groups at 11 am and at 3 pm / € 10 per person ~ information and reservations: tel. 349.6447343). In the hall, will be displayed some artworks of the TAVOLE A TAVOLA collection, and at 5 p.m. will be performed E BON! 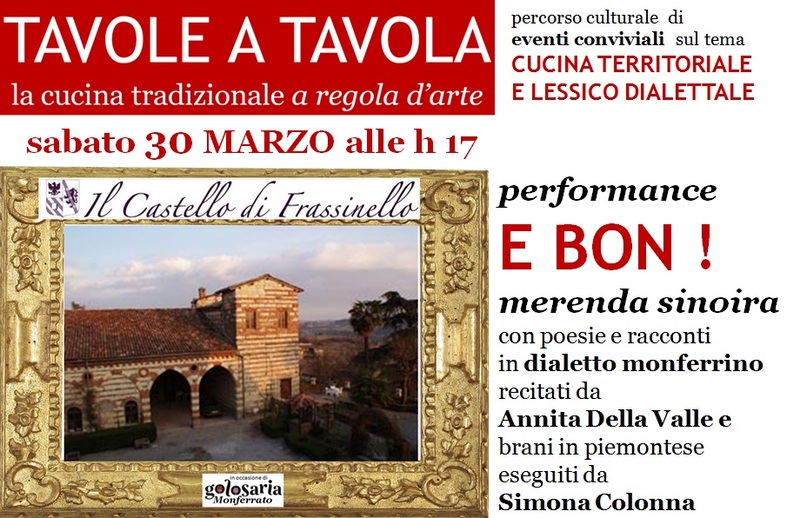 : poems and stories in Monferrato dialect will be recited by Annita Della Valle, the singer and musician Simona Colonna will play some pieces of her repertoire in Piedmontese dialect, and in the meantime TAVOLE A TAVOLA’s staff will serve at the tables the traditional MERENDA SINOIRA (non-compulsory consumption ~ a glass of wine or juice, one “salty” dish and one “sweet” dish / € 15 each – reservations: +39.345.0674035). Spring events will take place on 30 March at Castello di Frassinello and 31 March at the Castello Bolognini di Sant’Angelo Lodigiano. The initiatives are organized by the Cultural Association Dire Fare Disegnare of Casale Monferrato in collaboration with Vicolo del Pavone Edizioni, Fondazione Enrico Eandi, the Monferrato HospITALITY & Handmade and Contesti Turistici teams, the media-partner Tortona Oggi, Tutto sulle Galline e Viaggi fino alla fine del mondo, with contributions from Sanber – Casale Monferrato and Spalla Ortofrutticoli – Borgo San Martino and under the patronage of the Provincia di Alessandria, Alexala and Confagricoltura Alessandria.